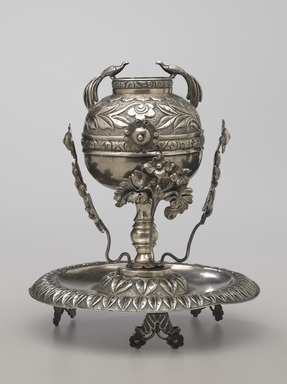 A globular silver mate cup with floral decoration both free-standing and applied. A peacock-like bird adorns the rim on two sides. The stemmed mate cup rests on a three-footed tray with upside-down flowers in pots used for the feet, and a decorative leaf-like design around the rim. Three of the free-standing floral surrounds remain, one has broken off.